Over the past year, hundreds of eighteenth to early twentieth–century garments have passed through the Textile Department at LACMA’s Conservation Center: royal wedding gowns, French Revolutionary waistcoats and breeches, and Victorian walking suits, to name a few. These historic costumes are part of the recently acquired costume collection to be featured in the upcoming exhibition Fashioning Fashion, opening this fall in the new Resnick Pavilion. 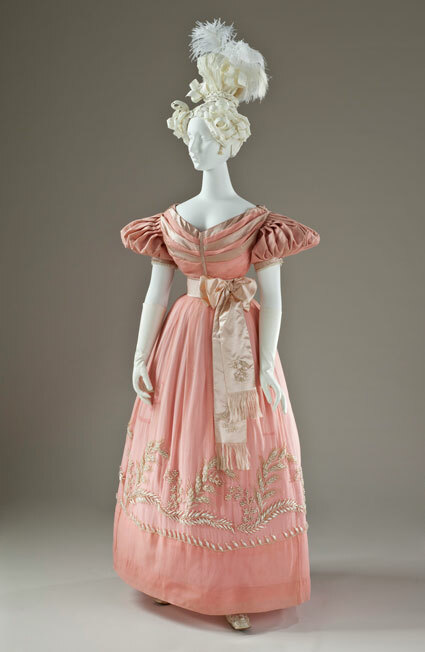 One of the exhibit’s highlights is a diaphanous pink silk gown from the 1830s. The skirt is decorated with a sea of faux pearls which weigh down the sheer silk and would click together lightly as its wearer moved. 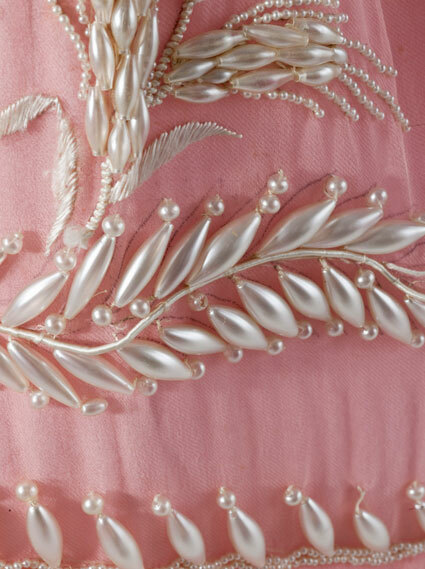 Collaborations between LACMA’s Textile Conservation & Research Departments reveal these faux pearls were manufactured in a curious manner: delicate and hollow glass beads were filled with a slurry of material derived from fish scales and gelatin or sturgeon glue. 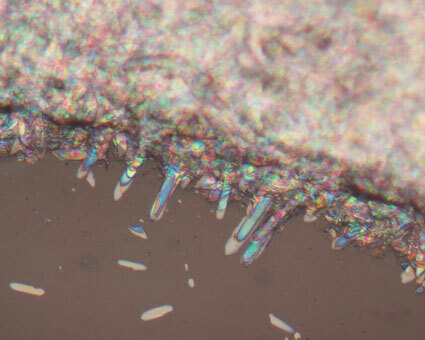 This slurry coated the interior face of the hollow bead creating an iridescent, or in this case pearlescent, effect. This curious technique was developed by a seventeenth-century French rosary maker. The story goes that the rosary maker, Jaquin, while vacationing in Burgundy, observed that a tub in which fish were soaking bore a film of silver particles on the water’s surface. Skimming these particles and dehydrating them, he was left with a lustrous powder. He felt he had the makings of an iridescent pigment and began experimenting in the manufacture of faux pearls. Initial trials (and a suggestion from a clever female customer) determined that the pigment only held fast to the glass surface when applied on the inner surface of a bead, injected in one hollow end of the bead and allowed to drain out the other end. When applied to the outer surface, the necklace wearer’s body heat and sweat dissolved the coating, creating a mess. This trade secret was closely guarded until 1716 when it was outed by famous French naturalist M. de Reamur, whose knack for experimental study led him to work out numerous trade and ancient manufacturing secrets. After Reamur’s revelations, this manufacturing technique became common in Europe and faux pearl beads produced in this manner decorated historic costume in the centuries to follow. 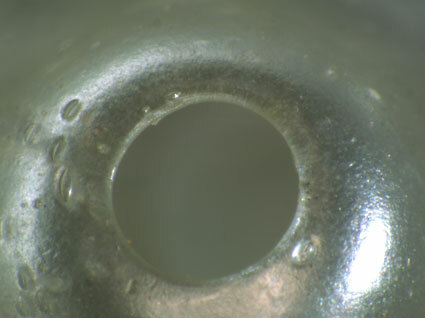 These images show the even manner in which the coating covers the inner part of the bead. A small drop of the slurry was swirled around inside the bead. LACMA Associate Conservation Scientist Charlotte Eng was able to separate the pearlescent coating from some broken beads. Magnified images show the platelet-like guanine crystals which give fish scales, and the pigment found on these beads, their iridescent appearance. Pretty neat stuff. This entry was posted on Thursday, May 6th, 2010 at 6:00 am and is filed under Uncategorized. You can follow any responses to this entry through the RSS 2.0 feed. You can leave a response, or trackback from your own site. This is wonderful–thanks so much for revealing the secret of faux pearls, something I never considered, but now I will. Bravo on another fine piece of writing from the museum staff. Amazing technique for the period for when it was created. This is remarkable and so interesting. Just saw the exhibit in person and to have this info to go along with the images is fantastic, thank you! I just visited the exhibit today for the first time, and it was as impressive as the photos here and on the LACMA website! This dress was one of my favorites – thank you for sharing some extra detail on it, so when I saw it today, I could appreciate the construction and materials fully. The exhibit was unusually informative, as well as visually stunning – But I wish they hadn’t displayed the first series of white clothes on white mannequins & the grey background – it didn’t provide needed contrast. As for all the needle work – on the one hand I was dazzled by the artistry of all those anonymous seamstresses and workmen – while at the same time thinking how they probably went blind trying to do such fine work in an ill-lighted garret! Lovely garment & informative article. I was interested to see the markings for the pearl placement were visible. Was this usual? I was under the impression that such markings were never allowed to show. Simply fascinating ! Thanks for sharing these old secrets.